Last week we saw the publication of the Financial Conduct Authority’s (FCA’s) response to its Consumer Approach consultation which contained some very positive news for those people interested in Vulnerability. First of all, the FCA stated that it will be retaining it’s original definition of a vulnerable consumer as ‘someone who, due to their personal circumstances, is especially susceptible to detriment, particularly when a firm is not acting with appropriate levels of care’. Last year the FCA put forward a new definition which was too lengthy and too wide ranging and so following consultations with interested bodies they have now decided that they will not be proceeding with this revised definition. Secondly, the regulator has committed to a new push on vulnerability with plans to introduce new guidance for firms to help them to identify and support new customers in vulnerable circumstances, which are scheduled to be published later in 2019. Unfortunately, early indications seem to indicate that this report will not address the much-needed question of data sharing, however, the VRS will be pushing for this topic to be included. I was horrified to read the story of a care home owner who was recently jailed for taking more than £4 million dishonestly from his victims. These victims were elderly residents at the Barton Park Nursing Home in Southport and the fraud took place over a prolonged period of time. And if stealing £4 million wasn’t bad enough, the perpetrator then launched civil action against the estate of a deceased couple in a bid to claim £10million for their care over a two-year period. The sheer amount of money is staggering but even if it was just £4 that had been stolen, to us the principle is the same – stealing from people who place their trust in you is despicable. Whilst the sums involved in this particular case are phenomenal, sadly the story isn’t unusual. A quick internet search will reveal hundreds of similar stories about elderly people who have been taken advantage of and stolen from whilst in care homes. The Vulnerability Registration Service (VRS) recognises the many forms of consumer vulnerability and provides a single reference point for consumers and organisations, enabling an individual’s vulnerability issues to be handled sensitively and professionally. Whilst the Vulnerability Registration was launched a little too late for the residents of Barton Park Nursing Home, it may be the perfect solution for people in a similar situation today. For further information visit Vulnerability Registration Service or contact them on info@vregservice.co.uk or call: 024 7767 2996. Within the collections industry in recent years, two of the most frequently used words have been vulnerability and transparency. The former due to the fact that, not that there are more vulnerable customers, but that we are being more pro-active in identifying them and handling them as customer centric businesses should. The latter is maybe more to the fact that increased regulation has led to us opening the doors and ensuring that our practices are fit for purpose. Although great strides have been taken, are we as a whole really doing enough in both areas to allow us to really serve vulnerable customers as efficiently as we should be. A clear annoyance for vulnerable customers is having to repeat the same information about their situation to every different company that they speak to. This is difficult for them and is not the customer centric approach that we all claim to have. Surely if a customer gives this information once and permits to sharing the details then all relevant companies that they would speak to would get this information. This would allow the company to tailor its approach accordingly and deal with the customer with empathy and understanding in a pro-active way. Vulnerability is not a process or a policy that companies need to adhere to, it is a way of life and a real situation that impacts so many people. The Vulnerability Registration Service allows us to do this but it needs input from across the sector. By doing it then we really will be treating vulnerable customers fairly and we won’t just be paying lip service to being a caring and transparent company. Have you noticed an increased number of online gambling adverts during the World Cup? Over the past few weeks it’s been amazing to watch TV and to see so many opportunities for people to bet online or by text. Enticing ads seem to imply it’s good to gamble, some ads even going as far as to make you think that it’s cool to be in a gang/group of likeminded gamblers. In addition, there are numerous gambling ads encouraging new people to dip into the exciting world of betting your money. The reality is that for many, especially younger men who follow sport, is that gambling can easily become more than “a bit of fun”, it can become a serious addiction and in some sad cases leads to suicide. The number of over-16’s who have a problem with gambling is thought to have risen by a third in three years according to a report by the Gambling Commission with about 430,000 sufferers in 2015. In addition, more than two million people in the UK are either problem gamblers or at risk of addiction, according to the industry regulator, which warned that the government and industry were not doing enough to tackle the problem. 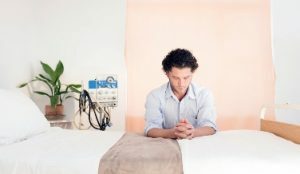 A vulnerable person may be unable to protect or may be unable to take care of themselves, or unable to protect themselves against significant harm or serious exploitation and be especially susceptible to detriment, particularly when a firm is not acting with appropriate levels of care. The dilemma for many people who gamble is they would not diagnose themselves as ‘vulnerable’. Vulnerability is not just to do with the situation of the consumer. It can be caused or exacerbated by the actions or processes of firms. Online gambling is a rapidly growing industry and uses sporting events such as the World Cup to hook people, including teenagers, into a gambling habit. What starts off initially as a harmless diversion can quickly lead in to a world cupped in debt and despair and in some extremely sad cases self-destruction and suicide. The purpose of the VRS is to help protect consumers in vulnerable circumstances. The VRS is a single reference point to allow individuals to protect themselves against further debt or related financial problems that can be caused by a whole host of reasons including, for example, the need to borrow money to chase money lost when betting and in some cases manic spending sprees. The sole purpose of the VRS is to protect consumers and provide organisations with a tool to complement an organisation’s regulatory and social responsibilities around dealing with vulnerable people at a particular point in their lives. The VRS is independent of any other database provider or credit reference agency. The VRS uses a very straightforward proprietary set of vulnerability flags that signify the source of the Registry entry – typically the consumer themselves, either directly, with the VRS or through a User of the service, for example a lender. A VRS User simply searches the VRS data base and if a match is found, the User follows the consumer’s flag request. A vulnerable consumer or an individual acting with the consent of a third party can choose the auto decline flag and self-exclude themselves from further credit/borrowing/mailing lists by choosing auto decline. Users of the VRS register simply follow the vulnerable consumer’s request and auto decline any matched applications. Another VRS proprietary flag type refer means a VRS User must pass the case to its manual underwriting team for referral and deeper decision-making conversations with the vulnerable consumer. Another VRS flag type Financial Hardship can be registered by an acting third party or a firm dealing with the vulnerable consumer by raising a flag whereby specific, identifiable and acute financial or other hardship and vulnerability has been identified to the extent that it serves the consumer’s best interests to flag this with the VRS. This would allow all Users of the VRS to make better process decisioning at the front end. The VRS believes in being proactive rather than reactive to serve vulnerable consumers better, be it lending, mailshots, debt collection activities, utility service providers, in fact any firm whose ethos is in customer care and treating customers fairly from the very outset. The VRS looks at the manifestos of the major political parties all of which make commitments to improving mental health services and support. Each of the principal political parties that have so far published their manifest has devoted time and thought to the highly sensitive public policy issues of consumer over-indebtedness and mental health. Mental health is finally getting the political attention it has lacked for decades. The broad range of commitments and issues addressed by the main parties reflects how mental health affects so many areas of life. After 8 June, it will be up to the next government to work in all of these areas and deliver actual change for people living with mental illness. For their part, the conservatives have said that they would if elected, wish to: adopt a “Breathing Space” scheme, with the right safeguards to prevent abuse, so that someone in serious problem debt may apply for legal protection from further interest, charges and enforcement action for a period of up to six weeks. Where appropriate, they will be offered a statutory repayment plan to help them pay back their debts in a manageable way. This will give eligible debtors time to seek advice and assistance to apply for a sustainable solution to their debt. The Liberal Democrats have noted that eight million Britons are experiencing debt problems and stated that they would “take forward the recommendations of the House of Lords Select Committee on Financial Exclusion” which had earlier this year proposed the government should seek proactively to protect people with mental health problems from financial harm by allowing them to opt into a series of controls on how they managed their financial affairs. Whilst all very encouraging the main focus of all the parties’ manifestos is at the downstream effects of over indebtedness. The beauty of the VRS’s rationale and platform is that its venue would address many of the upstream problems faced by overindebted Britons – in other words, at a point well before they could get themselves into acute personal difficulty. Such early intervention would, therefore, be likely not only to reduce the scope of personal duress and hardship, but also reduce the potential exposure of the taxpayer by addressing problems well before they had already occurred – and the taxpayer was on the hook. The VRS has strategically developed a range of strategic relationships with a broad cross sector of industry, among others, charities, debt advisors, relevant trade associations, credit reference agencies, lenders, specialist Insurance Initiatives and consumers alike. Additionally, VRS has begun to develop a promising dialogue with a range of relevant regulators including OFCOM, OFGEM and OFWAT. Work with these stakeholders and actual and prospective site users is now well under way and starting to generate useful and usable outputs and outcomes. A range of case studies now been added and the website is now well populated and ready to deal with the site traffic that it was built to manage. The VRS believes a better life is possible for the millions of people affected by mental Illness and problem debt. Time for talking is over and action is needed and needed now. Since our “open doors” launch on the 1 st March 2017 the VRS is pleased to announce that Consumers are self-registering. We are also delighted to announce the continued interest and sign up of new firms from across all sectors that wish to use and subscribe consenting consumers to the VRS register. All organisations have a social, moral and regulatory responsibility to identify vulnerable consumers and many have invested considerably in this area to see, consider and support people at a particularly difficult and stressful point in their lives. But having identified and counselled a vulnerable consumer, until now there has been no way to make sure their circumstances are known to other organisations and that consumer will have to go through a similarly distressing experience repeating their very personal story. The Vulnerability Registration Service starts to address this challenge by providing a platform organisations using the service with a single point of reference as a tool to complement their own vulnerability responsibilities and further protect the consumers they serve. The VRS is actively engaging with all sectors of the community either committed or intending on joining the VRS, including Utilities, Banks, Local Authorities, Debt Counselling Services and Insurance Companies, and of course Lenders including P2P and HCSTC. The VRS has also held very positive talks with OFGEM and are engaged with a number of other high profile representative bodies. The VRS has also held encouraging talks with the Financial Conduct Authority and the Financial Ombudsman Service and continues open dialogue with both the UK’s financial Regulator and the UK’s official expert in sorting out problems with financial services about how the VRS service is being received by all sectors. The Debt Counsellors Charitable Trust is committed to providing free, independent and impartial advice, information and support to people who are experiencing financial difficulty. The Debt Counsellors Charitable Trust is now loading consenting vulnerable consumers to the VRS register. The Carers Trust is a major charity for, with and about carers. Carers can register with the Vulnerability Registration Service so that organisations that check the register, such as financial services, will know that the person they are caring for is vulnerable. As a carer, you can’t register for the person you care for unless you have a formal agreement, usually a Power of Attorney. The Vulnerable Registration Service website will ask for evidence of this and sight of the appropriate document. The Carers Trust is a user and supporter of the VRS service. The CCTA established in 1891, has a long and powerful history. The CCTA is an association representing businesses that provide credit to consumers. The CCTA work to guide their members through stringent industry regulation, offering uncompromising practical help to ensure their companies runs effectively and ethically in this competitive arena. The CCTA services include, legal advice, complaint conciliation, training, credit agreements and a comprehensive ‘news update’ and media network. The VRS is delighted to welcome the CCTA as supporters of the VRS. Ferratum UK are a customer focused, responsible direct lender at the forefront of the mobile revolution in banking. They offer customers a fast, easy to use highway to mobile lending services. We are delighted to announce that Ferratum UK have adopted VRS as a method to identify vulnerability and help safeguard their customers. VRS Directors Tony Leach and Mike Bradford have written articles for the latest edition of the magazine CCTA Consumer Credit 2017 Issue 2, you can read their articles on pages 32 and 33 respectively. How the VRS can help vulnerable consumers – independent and free debt adviser case studies. The names have been changed for anonymity. DeborahDeborah contacted us due to having debts of £3500 with no ability to pay them. Deborah’s debts are all non-priority debts and includes credit cards, store cards,catalogues and an overdraft. Deborah lives with her mum and works part time but also receives the health benefit ESA and is looking into a PIP award, Deborah suffers with Bi-polar disorder and is under the support of a CPN. Deborah explained to her adviser that she periodically suffers debt and money management issues as due to her condition she has “high” periods which for her, includes spending money she does not have. also mean that her creditors can recognise her vulnerability and amend their collection practices accordingly. CarlCarl has severe mental health issues including social phobias which prevent him leaving his property.Carl has £82k of debt and although he would qualify for a bankruptcy his mental health is so disruptive that the thought of a bankruptcy causes him fear and panic. Carl’s only other option to rid himself of the debt is via requesting the creditors write off the debt. The adviser supporting Carl has been doing so for 11 months and although some debts have been agreed to be written off, others are still in the process of negotiation. Should the VRS be utilised widely it’s anticipated that these types of negotiations with creditors could occur in a much more timely manner and with greater ease, overall preventing detriment to the client. John contacted us as despite obtaining a DRO and clearing his debts two years ago, he has built a further £2K in credit debts and cannot afford to repay them. John lives with his two children and cannot work due to mental ill health. John explained that he is a perpetual spender and although he knows that he cannot maintain the financial commitment he makes, his depression encourages him to obtain credit. If John signed up to the VRS it would mean during these difficult times whereby he feels the need to spend credit, he would be prevented from doing so. It would also mean that his creditors can recognise his vulnerability and amend their collection practices accordingly. There is no doubt automated services are increasingly being offered online across all business sectors and are becoming more remote. This can make it extremely difficult for firms to identify a non-standard consumer’s situation or circumstance. In many cases automation processes, will not identify a consumer’s vulnerability and real life events will not be factored in. The failure of internal automated systems to spot vulnerable consumers can lead to an unwanted situation where a consumer may suffer detriment.Pro-active solutions that can help prevent vulnerable situations from the outset are what is needed and needed now. Our policy-makers both in the UK and internationally have already realised that a flexible approach is necessary to meet the needs of a diverse customer base. Vulnerability includes many different conditions that can affect any one of us at any time of our lives. It makes our coping skills and resilience feel frail and exposed to detriment if the situation is not handled appropriately by the firms and organisations that provide us all manner of financial services. There is no doubt vulnerability is a key issue within the Boardroom of most firms worth their salt. Our own government says one in four people will experience a mental health problem at some point in their life, with an annual cost of £105bn. Our Prime Minister recently said mental health had been “dangerously disregarded” as secondary to physical health and changing that would go “right to the heart of our humanity”. It is right that all financial service and financial firms should focus in this important area. “VRS”, enabling an individual’s vulnerability issues to be handled sensitively and professionally. The Vulnerability Registration Service (‘VRS’) has been developed to help vulnerable consumers protect themselves against the financial, social and very personal hardship suffered as a result of debt and financial problems. The VRS is independent of any other database provider or credit reference agency. Its sole purpose is to protect consumers and provide organisations with a tool to complement their regulatory and social responsibilities around dealing with vulnerable people at a particular point in their lives. It does not replace an organisation’s responsibilities for identifying and counselling vulnerable consumers, but provides a ‘decision agnostic’ platform for consumers and the organisations they deal with as an additional safeguard for consumers during their period of vulnerability. The VRS recognises the many forms of consumer vulnerability, including that of mental health or incapacity (half of those in debt crisis have a mental health problem*) and provides a single reference point for consumers and organisations participating in the VRS, enabling an individual’s vulnerability issues to be handled sensitively and professionally. Whilst most organisations are handling vulnerable cases as best they can, it invariably tends to always be after the event and this is where detriment can come in. Many common vulnerable scenarios are clear and obvious, for example; the death of a loved one, divorce, being made jobless or homeless or in suffering a life-threatening disease, these are vulnerable situations that we can all recognise. In many cases where people experience vulnerable situations they will also suffer a financial shock, this is separate to the emotional outcome. It is well recognised that mental health problems can cause severe debt, and severe debt can cause mental health problems. There are many less well known vulnerable scenarios that many people will not have heard of and whilst not wishing to begin to describe or prioritise each one, one that particularly rankles is financial abuse whereby one partner financially abuses the other by using their partner’s identity and having access to banking details fraudulently obtains credit or goods and leaves the debt to the abused partner. Partner intimidation and financial abuse is without doubt an awful situation to find oneself in, magnified if children are present. Pro-active solutions that can help prevent vulnerable situations from the outset are what is needed and needed now. It is encouraging to see that from the Government, including the Prime Minister, the Financial Conduct Authority, mental health organisations, practitioners and the many charitable organisations and groups that the vulnerability issue is being raised and given more prominence. All businesses across all sectors need to start stepping up to the Vulnerability challenge. The Vulnerability Registration Service (‘VRS’), the UK’s first central register for helping vulnerable consumers protect themselves against further debt or financial stress, opens its doors on 1 March through its dedicated consumer portal. All organisations have a social, moral and regulatory responsibility to identify vulnerable consumers. And many have invested considerably in this area to help people at a particularly difficult and stressful point in their lives. But having identified and counselled a vulnerable consumer, until now there has been no way to make sure their circumstances are known to other organisations and that consumer will have to go through a similarly distressing experience repeating their very personal story. The Vulnerability Registration Service starts to address this challenge by providing a platform for organisations using the service with a single point of reference as a tool to complement their own vulnerability responsibilities and further protect the consumers they serve.